I find it strange that in the last little bit, I’ve had no memories of any of my apparent past lives. The most recent flicker of anything was that of having been a sailor around the year 1848, but admittedly I haven’t found anything at all to support that other than a very hazy image of a large multi masted ship on the ocean, someone in a white uniform on a rat line, and the vague idea of it being that particular year. I have, however, plotted a visual chart of the (human) lives I’ve remembered so far and the coincidences/synchronicities between them that I could recall. What I’ve plotted out so far is really interesting! I’ll post that soon enough. Apparently, the part of France William fought in was only 31 km from the part of France John fought in. John was killed at Houplines, in Nord in July 1915. From there, eastward just past Lille, is the town of Bouvines where, in July 1214, William Longespee, together with his half-brother King John and their ally, Otto II, fought the French forces led by King Phillip II. The Anglo-German coalition, incidentally, was defeated. I had no idea these places would be so close together, or that the dates were only just a little over 700 years apart. Furthermore, I’m frankly surprised that both the memories and locations all sync with a historical figure of some prominence; my previous life I was pretty well respected among intellectuals and fans of the genre I wrote in, but not really a major historical figure by any stretch; in the life before that- the first life I remembered- I was just a farm boy from Somerset. This also leaves some strange questions. What happened in the almost 7 centuries between my time as William and my time as John? Why did I go from the Earl of Salisbury to a farm hand who probably made a living picking hops, yet still have these strange, tangential things in common? Maybe I was merely obsessed with William Longespee or King John in my life as John Harris, and tried to emulate them by joining the army and proving myself in an act of valor; it could be that as John, I visited his grave in Salisbury and heard the story of King John’s troops at Bouvines. That doesn’t explain my memories of being in a ruined abbey as John and remembering a similar abbey (though probably not the same one) in its active days hundreds of years before. I just have a hard time believing that this was me, even if memories and circumstances are telling me that this is a distinct possibility. *Linked to both Somerset and Shropshire. Still not sure if this is “confirmed” though. I want to hold out for a more precise match before I say that was me. Rather interesting how the places all line up though. This is getting very strange. I found another church, this time in England, and here’s the cool thing: among its accents are a dark variety of marble called Purbeck marble, which are used in the columns. It’s possible what I saw wasn’t along the nave but in one of the chapels, but that would cast doubt on my theory that this is where my wedding was held. It would, however, explain why I remember there being a complex of these columns with something like a canopy overhead. Still, my memories seem to have me waiting at a doorway in the screen, as if waiting to enter the Nave, so I’m a bit confused by what I’ve seen. I need to see pictures of the chapels in Salisbury cathedral to really be sure. Still, it would be interesting if Salisbury Cathedral did turn out to be a match, considering its proximity to Yeovil where I would later be born in the 19th century. Another theory I’ve had- and this is borne out somewhat by wrought iron screens in a small part of the Nave at Canterbury Cathedral (I can’t find a good picture, but if you go to their website and look back at the Nave from the Crossing in the 3D view you can kind of see them)- is that the church I remember was built with pilgrimages in mind and that the screens with their narrow black columns were there to control the flow of pilgrims through the sanctuary. I feel like I’m hot on the trail. The information in this term’s art history textbook has been of great help in directing my search. Interpreting what I saw in a brief flash of maybe 1 seconds’ memory will be difficult but I’ll see what I can do. There was a structure like this and all but a portion of it set aside for a doorway had a low-lying screen. 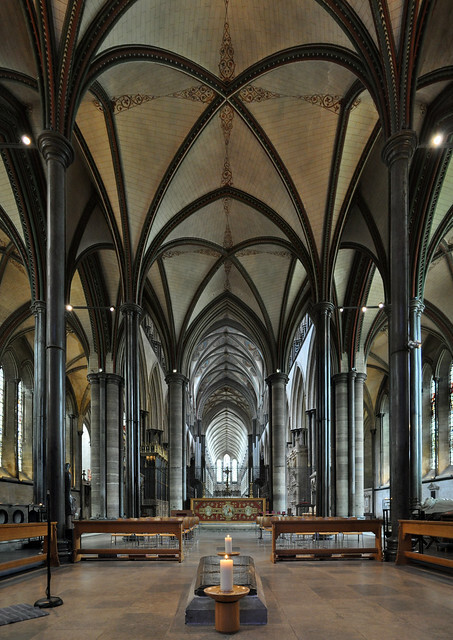 The difference is, I recall that structure being a screen that separated the aisles from the nave, and I remember standing there, as if waiting to proceed into the Nave. I was male, and wearing a close-fitting outfit of finely-made but tough fabric that had a good bit of crimson. It was about what you’d expect a knight or other fighting man to wear on a state occasion: something flashy but practical that was nice enough to wear in a chapel, but tough enough to wear in a sword fight. Sainte Chapelle is a chapel built in the High Gothic, which supports my thoughts that this was some time in the 13th or 14th century. I’m a bit astonished that I’m finding the best examples of the sort of architecture I’m looking for in France rather than England. Perhaps the abbeys near Shrewsbury were not where I was a monk, but merely reminded me of an abbey somewhere in France; or perhaps the features I’m looking for once existed in England but were scoured from the land under Henry VIII and a succession of reformers that followed until the 17th or 18th century. That’s the difficulty with reconstructing memories from the Middle Ages: you have just enough in the record to learn a lot about the general gist of how people lived, but there are huge holes when it comes to specifics. If I can trace this life to anyone who lived in the Middle Ages, I will have pulled off something truly remarkable in the way of historical research. The nautilus is what scientists call a living fossil. It is a very primitive cephalopod, a relation of squids and octopi. A little over a hundred million years ago, most of them evolved beyond the need for shells, but the little nautilus didn’t have to change a whole lot; it’s almost the same way its ancestors looked when dinosaurs roamed the earth. To think the sea once teemed with such creatures, some in large sizes and with magnificent, long, swordlike shells.. Now all we have are the broken and colorless shells of these early cephalopods. I have to wonder what sort of amazing colors their shells might have been before fossilization left us blank casts of them. The sea really lost some of its splendor when the rest of the cephalopods evolved away from the need for shells. Then again, they’re a remarkable order in their own right and might even replace us one day, seeing how adaptable they’ve been. Sometimes I wonder about where I was when creatures like these were the dominant life form, if my ideas about reincarnation are correct. Does the soul have a definite age? Was there some spark of being that would some day become me there, in that primordial sea? What was I? A curled ammonite? A gracile orthoceras? Or perhaps I was only a humble little trilobite grazing on the detritus from their meals. Or perhaps, the thought or wavelength or big steaming ball of dukkha that became me hadn’t broken through into existence yet. I’ve had intuitions- and vague ones- of lives as creatures in the Pleistocene (as an ant and a mastadon) and the Devonian era (as an early sort of bony fish). But I don’t really trust these intuitions because I have no memories I can trace. For now, I consider my disposition in pre-human times a mystery that will probably never be solved. Still I wonder… Where was I when the seas teemed with colorful shoals of creatures like these? Was I there? I tried, but I can’t put it down. I can’t walk away. Maybe my writing is too intellectual, or too derivative, or too this or that… I still do it. If I quit writing I’ll have lost my voice. I’m not very good at expressing myself in spoken words; in fact I stumble when I try, or say things that I don’t mean, or string words together awkwardly and don’t always get through to people. When I write, at least I can get my ideas down and people can kind of follow my logic on things. It’s my one release, my one option, my one way out of the shell of awkwardness I live in. I can’t stop writing. I may as well stop breathing if I did that.